There are over 133,000,000 blogs actively indexed by Technorati. Each day 900,000 posts are published to those blogs and they are read by 346,000,000 people worldwide. Well, maybe not all of those 900 million posts are read. Those numbers stagger the mind (see source here). But serious blogging is about words, not numbers. Content, not concept. Substance, not flash. Authors, not note takers. If one closely examines the blur of daily posts one begins to realize that most of what is written is not inspired, but contrived, perhaps even forced so the owner can stay on a posting schedule driven by an obsession to increase readership. There’s no harm in that, as most of us, including me, post to keep visitor momentum. As the December sun sets on the newspaper we find ourselves in a rare moment in time. How we handle that moment is important. Will we continue to obsess over the numbers, or will we step back and step-up to the task of replacing a storied source of information? But it’s probably not about replacing traditional writing form factors. That would be very difficult, perhaps even impossible as I discuss in an earlier post here. In my opinion, the element that produces the most emotional work is without question; passion. Arguably it can be manufactured, but only in small doses and it’s not sustainable. Even the great newspaper machines struggled to maintain quality and keep ethics on the radar. But inside that editorial meeting there was most definitely passion. Real passion is discovered, revealed, teased out after having been drawn in by some intangible force. It emerges from one’s inner core. All of us have it. Most of us don’t recognize it as easily as others. Some lucky souls see it very clearly. They tame it then shape it. One of those people is Liz Goldner. She likes to poke around in the artist’s mind and has conducted hundreds of interviews to help her understand why someone creates, which leads her to scribe about something deeper, maybe not so obvious in the finished work. This pairing of conversation with the artist and study of the work has shaped her brand of observation into something special. She writes mostly about contemporary art, and cuts across photography, painting, assemblage, even graffiti. She likes to think deeply about theory as well as style, and delve below the water line. Postmodernism is a speciality. Of course getting a site like this off the ground takes time and care. One of the techniques she now has in the works is to offer a free eBook to her newsletter subscribers. It’s a smart idea to move beyond the inbox and onto the desktop. When I hear eBook it usually means someone has thrown together odds and ends and called it an eBook. 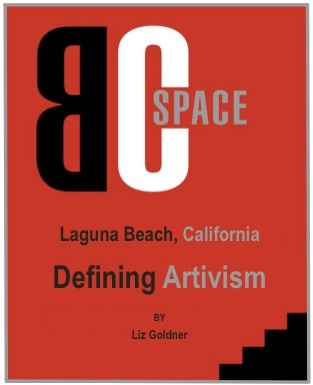 But when I opened BC Space: Defining Artivism, it was clear that this was what an eBook should be. It’s digest in size with a wide range of topics and compelling images sprinkled throughout. Fifty-two pages of history and cause, punctuated with that special behind the curtain conversation with the artists. It’s a generous gift. I wonder if it’s too generous. I asked her to reflect on how she came to develop this eBook, how long it took to create and in particular, why she chose BC Space as the tentpole. Here is her reply. Steve Furman asked me to write a page for his blog describing how long it took to write my eBook, BC Space: Defining Artivism. The short answer is three weeks. But the real answer is more than seven years. I originally wrote my eBook, offered free, as an incentive for people to subscribe to my newsletter. Yet completed, it took on a life of its own. I realized that the story of BC Space Gallery is so compelling that it could be the genesis of a larger eBook that I will sell through the Internet in the future. On March 30, 2003 (shortly after the Iraq War began), I walked down Forest Avenue in Laguna Beach, opened a heavy steel door and climbed the stairs to BC Space Gallery. I was there to interview gallery owner Mark Chamberlain about his exhibition, “Pretty Lies, Dirty Truths,” addressing the horrors of war. As Mark and I talked, I realized that the thoughtful, artistic person facing me was leading the adventurous life I had always yearned to live. I was attracted to the artworks on display, to the spare magnificence of the 30-year-old art space and to the philosophical perspectives and bohemian lifestyle of the gallery owner. Mark and I began a friendship that included dialogues about the relationship of art to social issues, and about the intersection of art and politics. Our conversations, in person, by phone and email, were punctuated by forays to art events, films and sometimes meals. Perhaps because Mark sees no separation between his work, art making and his life, he often weaves together tales of his childhood and adult life with those of his career as an environmental artist and of the ongoing development of BC Space Gallery. As Mark and I talked over the months and the years, I listened carefully to his words about the gallery and exhibitions and about the concurrent artworks he produced. As I questioned and absorbed his many stories, his focus, passion, courage and insights inspired me to be more focused, passionate and courageous in my own work. Mark was mentoring me to become a more confident and insightful art writer. A year after we met, Mark invited me to a slide presentation/talk that he and former BC Space partner, Jerry Burchfield, were giving at Laguna Beach City Hall. While the hour-long talk about their ongoing Laguna Canyon Project (photographing historic Laguna Canyon Road) was fascinating and expertly delivered, I was impressed by their passion for the work and by their camaraderie. In time, I learned that their deep, symbiotic friendship was often the catalyst for individual and joint artworks. Being a scribe, I kept many emails that Mark and I wrote to each other, turning them into documents. I also kept essays, press releases and letters that Mark sent and received. Mark and I joked about me being his personal biographer. What began as a joke became a more serious matter. No one else was keeping track of the ongoing multifarious activities of BC Space and its proprietor – a combination Mississippi River rat (he grew up on that river), campus radical, sensitive aesthete and unbridled mustang. Jerry Burchfield had been an excellent gallery chronicler, but he left BC in 1987 to teach full time. While Jerry continued to support the gallery’s activities, he no longer kept assiduous track of the evolving art space. After Jerry was diagnosed with cancer in 2007, I requested an interview to discuss his love for photography and involvement with BC Space for 14 years. He and I talked for several hours, then refined our discussion via emails. Last year, Cal State Fullerton’s Santa Ana exhibition space was preparing to mount “BC Space: Mything in Action,” chronicling the gallery’s 37 years of exhibitions. I was asked to write BC’s history for a catalog accompanying the show. I spent four months writing, researching and refining my words, often with the help (and provocation) of Mark Chamberlain. This year, I expanded the 3,500-word history into my 9,000-word eBook, Defining Artivism. From late June to mid July, I worked nearly 200 hours – often in the middle of the night – on this eBook. I revised my original history and added in many comments about Jerry and Mark from artists and supporters. I also added a chronology. For three weeks, I wrote day and night, drawing from a bottomless well of creativity. During that period, I mused that art often draws from and follows life experiences. In particular, the artistry I was building in Defining Artivism was inspired by the subject matter I was writing about, including my many experiences at BC Space Gallery over the years. You were forewarned about the passion thing weren’t you. This kind of commitment and care is more common than you might think among people who write vs. post. Certainly there are serious blogs out there that explore with great prose and structure. And a blog was not originally developed to be a replacement for a finely crafted magazine or newspaper article. However, a blog is a technology tool, and with all tools the final product that comes out of using a tool varies greatly. There’s room for all of it certainly. Take a moment and subscribe to the Contemporary Art Dialogue newsletter to get a free copy of the eBook and see for yourself. By the way, in case you were thinking of using the eBook technique to promote your own blog or site efforts. The bar is now officially set to high. As the newspaper fades away and the torch of journalism (term used loosely) passes to the masses, we will need to raise our game to meet that awesome responsibility. Many people fear this moment because of the drastic change and loss of something tangible. Yet another thing we were so comfortable with has been taken away. Not so. This moment should be embraced and cherished. Celebrated even. Keep your passion burning brightly. If you don’t have it yet, find it. It’s right there in front of you. And most importantly, keep writing. Next Post: Three Years of Blogging. Really.